Hey Girl! Have You Ever Thought Someone Was White Before You Met Them Based On Their Sense of Humor? Have you ever thought someone was white before you met them based on their sense of humor? Have you ever pre-selected a black person’s tastes in music, film or food, based on their skin color? Have you ever done the same for a white person, an Asian person, a Latino person? For example, have you ever asked a black acquaintance if they’ve heard the new Jay Z/Kanye album, or tell them how one of your favorite Denzel Washington movies is Remember The Titans? Have you ever told a black person you just met at a dinner party how much you love the Alvin Ailey Dance Troupe, or that you own the boxed set of DVD’s of the television show, The Wire? Maybe these are two different things, maybe they’re not–the assuming of someone’s race who you haven’t met by the content of what they say they’re interested in, either on the phone or via email, and, the assuming that black people are only interested in popular culture derived from black artists. I know I have made these kinds of assumptions, made some of these social conversation faux-pas. 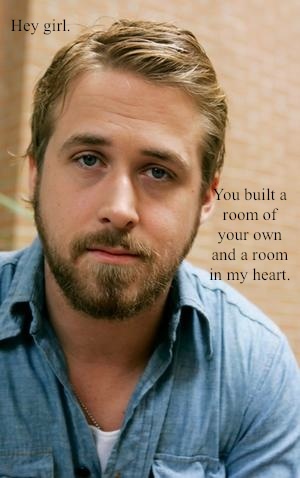 I even made one today about the woman behind the blog sensation, Feminist Ryan Gosling, Danielle Henderson. 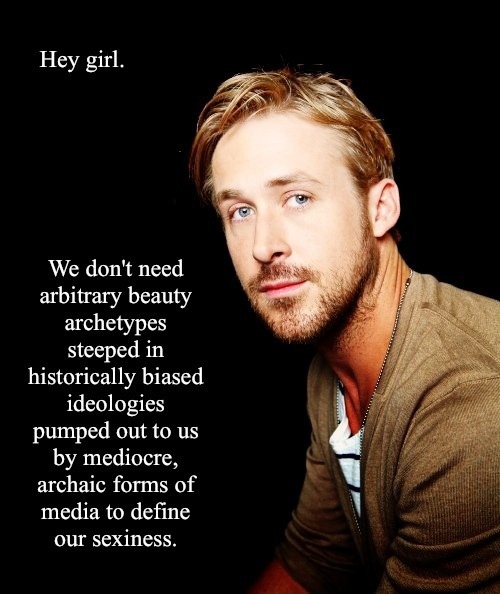 Danielle is a University of Wisconson graduate student in Gender and Women Studies who, inspired by the Ryan Gosling meme posters first seen on Tumblr a few years ago, created her own RG memes with a feminist theory theme. They’re hilarious–and I can’t help but swoon over the image of this dreamy guy spouting heartfelt feminist theory like he means it. However, when I first saw them a few months ago, I assumed the creator was white. Why? Good question. I had heard they were being made by a graduate student at a university and I imagined some priviliged white girl thinking she was so cool and clever to come up with these. I just didn’t consider that a black woman would choose Ryan Gosling, a white actor, to create her work. I, of course, didn’t even stop to consider any thoughts/analysis of who made this, and their creative decisions, whatsoever. I just know I didn’t have an image of a black woman in mind when I saw the posters. And there you have it. I believe we sometimes assume people’s tastes and creative output based on their race. 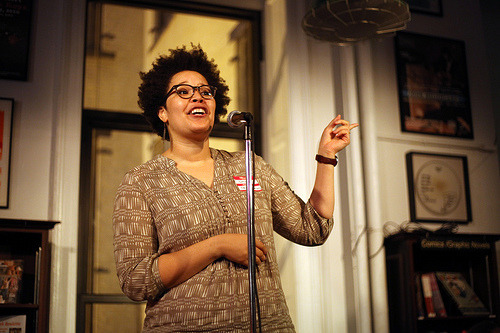 I’m glad that Danielle Henderson assumed that we’d think she was white, too. Read her statement below from her book launch party for Feminist Ryan Gosling. Yes, it’s out in book form this week! Thanks, Danielle, for challenging our assumptions, and for your awesome sense of humor and creativity in creating these posters that give us (me, anyway) an eye-pleasing, accessible way to learn a little feminist theory. I want to again extend my sincere gratitude to Housing Works, WORD and Tumblr (particularly Rachel Fershleiser and Jess Bennett) for throwing a completely boss launch party for Feminist Ryan Gosling: The Book, with extra-special thanks to the indomitable Maris Kreizman. A finer group of individuals has never existed, and I’m thankful for your hard work and cheerleading. I surprised a lot of people by being very tall, then surprised even more people by being Black. I’ve had 35 years to get used to both ideas, but you go ahead and take your time. I recently did an interview with The Village Voice. There will be a ton of interviews posted in the upcoming weeks; I’ll try to do a link roundup but you can also follow the FRG Twitter for updates.